The Central Bank yesterday urged banks to step up lending to small and medium enterprises (SMEs) with the aim of empowering the backbone of the economy. The call for more financial support for SMEs comes as the Government is planning to launch a national SME Policy Framework. Central Bank Governor Arjuna Mahendran said access to finance is of paramount importance, adding that the banking sector should aim at increasing its total loan disbursements to the SMEs sector to at least 25%, up from “an insufficient” 19% at present. “Only 19% of the total loans have gone to SMEs, and last year barely 1% was added to that. 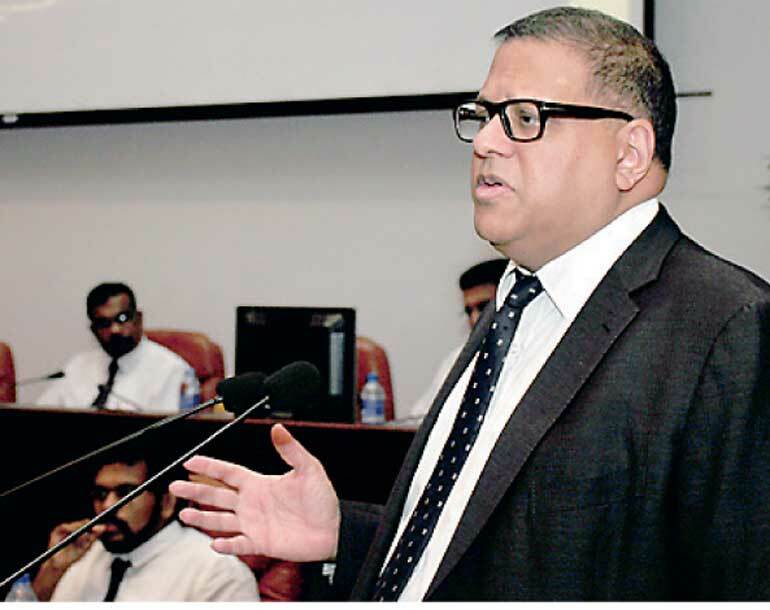 We must at least aim for 25% this year and work backwards to see how we can realise that target,” Mahendran said at the inaugural session of the Program to Promote Access to Finance for SME Development held at the Central Bank yesterday. The Ministry of Industry and Commerce in consultation with other stakeholders has articulated a national policy framework for SME development. It aims to promote high potential promising SMEs and improve the business environment to allow them to realise their full potential. He went on to say that the Government cannot borrow anymore, and therefore the only way the economy could grow is by empowering these entrepreneurs and getting the SME sector activated. The lack of communication between the Government and the banks was highlighted as one of the key reasons for the setback in the SME sector’s access to finance. Mahendran pointed out that the Government not talking to the banks to get these loans flowing to the grassroots was one of the key challenges. “There is a great delay from the Governmental institutions and its officials. Those officials are blocking all these projects from taking off and this is where the Central Bank can intervene to break those blocks and get the monies flowing without any disturbance to the SMEs,” he added. He also stressed that disbursing money to the grassroots is not something that should be done through a framework alone, but rather by thinking out of the box and implementing it in a practical manner. 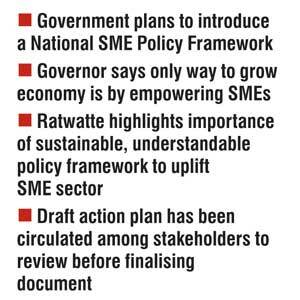 Senior Advisor to the Prime Minister Charitha Ratwatte meanwhile said that a sustainable and understandable policy framework to uplift the SME sector was necessary. The SME sector has been identified as an important strategic sector in the overall policy objectives of the Government and it is seen as a driver of change for inclusive economic growth, regional development, employment generation and poverty reduction. The sector is envisaged to contribute to transform lagging regions into emerging regions of prosperity. He further said that given the nature of the SME sector and the challenges faced, it was important to have a Government-led intervention and support mechanism to upgrade and strengthen the sector to meet the expectations of the country. The Government strongly believes that the policy will foster small enterprises to grow while the private sector should take full advantage of the basic provisions realising their full potential. Ratwatte said the Government’s plan of creating one million jobs would be realistic in the SME sector, and therefore empowering them with access to finance was essential. “We need the financial sector to adopt new ideas to get the SMEs moving, as targeting this segment would bring a drastic change in shaping up our economy for betterment,” he pointed out. Outlining the key features in the new Policy Framework for SME, Development Industry and Commerce Ministry Secretary T. M. K. B. Tennakoon said six intervention strategies have been identified: an enabling environment, modern technology, entrepreneurial culture and skills development, access to finance, market facilitation and research and development. In addition to the policy document, two other key factors such as regional balance and resource efficiency are also addressed. The Government has recognised SMEs as the backbone of the economy, as it accounts for more than 75% of the total number of enterprises, provides 45% of the employment and contributes to 52% of the gross domestic product (GDP). SMEs promote broad based equitable development and provide more opportunity for women and youth participation in the economic development of the country. He said the draft action plan has been circulated among the stakeholders to review before finalising the document. “Several major issues were raised by SMEs in regard to financing and collateral issue problems in obtaining loans. Lack of financial discipline was a key factor that was observed during the surveys, so banks have a major role in guiding the SME sector,” he noted. Noting that the line ministries and institutions have a wide role to play in implementing the action plan to ensure that activities are initiated on time, Tennakoon proposed that an Inter-Ministerial Committee be appointed to assist the implementation process of SME policy, which will be coordinated by an authority functioning under the Ministry of Industry and Commerce. Central Bank Governor Arjuna Mahendran yesterday lashed out at state banks for their inefficiency, accusing them of not meeting people’s expectations. The Governor asked the public sector banks to “give up” if they cannot serve their purpose, asking them to allow the private sector banks to take over. Justifying his comments, Mahendran claimed that some of the banks had tried to block funds which had recently been released by the Treasury to be disbursed among farmers as a fertilizer subsidy. “The Ministry of Finance has given the money to the banks to disburse, but they have held those funds as some of the farmers had not settled their overdraft. That’s not fair. They wanted those people to open new bank accounts, which is ridiculous. So I asked them to write a note and pay the subsidy. They don’t care what the people are going through,” Governor stressed. Mahendran commended efforts made by private sector banks, noting that they were expanding aggressively. “Every month I get around 30 to 40 new applications to set up branches outside Western Province, which is a good sign — at least they see the potential and are moving out. But, we have to ensure that they collect the deposits here and lend it to all the big Colombo companies,” the Central Bank Chief added.